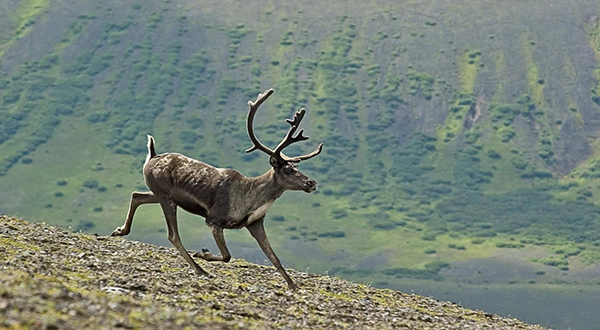 Will Arctic Animals Outrun a Tundra Turning to Forest? Will Arctic Animals Be Able to Outrun a Tundra Turning to Forest? When tundra landscape no longer exists, will Arctic animas, such as caribou, be able to outrun their swiftly receding habitat? Hear the phrase “global warming,” and you immediately picture your hometown with a hotter climate. You imagine a line of more southerly plants marching northward to where you live. In turn, as they advance, you can mentally see the plant species you’re now used to packing up, so to speak, and moving away from you—going farther north, as well. 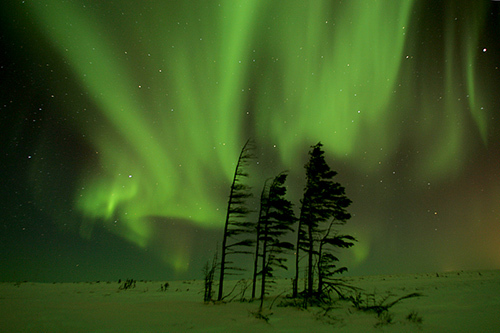 Shifting your gaze to the top of the world, you can easily visualize a tundra of the future being colonized by trees from the boreal forest to the south. We know that this scenario will happen and is even now occurring. But recently, researchers have reported an even more alarming finding: Shrubs already in the tundra are transforming into trees—within just a few decades. 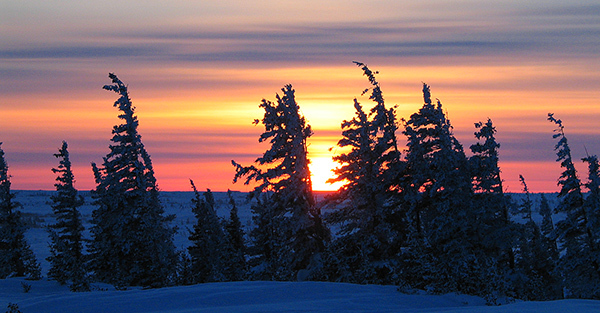 Soon, tundra may no longer exist, except in the Arctic Circle. 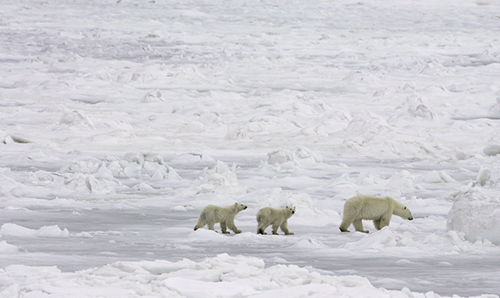 Will tundra animals—such as polar bears—be able to outrun their swiftly receding habitat? This startling finding was published on June 3, 2012, in the journal Nature Climate Change. Scientists from Finland and Oxford University in Great Britain investigated 38,610 square miles of northwestern Eurasian tundra that stretches from western Siberia to Finland. Surveys of the vegetation—using data from satellite imaging, fieldwork and expert observations from indigenous reindeer herders—showed that in 8 to 15 percent of this area, willow and alder plants have grown into trees more than 6.5 feet in height in the last 30 to 40 years. The result has significance not only for the Arctic but for the planet as a whole. A transformation from shrubs to forest alters the “albedo effect,” or the amount of sunlight reflected by the surface of Earth. In the Arctic spring and autumn, shrubs are typically covered under a blanket of white, light-reflecting snow. In contrast, trees are tall enough to rise above the snowfall, presenting a dark, light-absorbing surface. This increased absorption of the sun’s radiation caused by the shrubs’ growth in height will add to global warming, making an already-warming climate warm even more rapidly. Of course, the Eurasian tundra is just one, small part of the vast Arctic tundra; and it is a region that is already warmer than the rest of the Arctic, scientists think, because of the influence of the Gulf Stream’s warm air. However, the Eurasian tundra is a harbinger for the rest of the Arctic. • The annual average surface temperature in Arctic regions will increase by 5.6 to 9.5 degrees Fahrenheit, depending on varying greenhouse gas emission scenarios. • The warming, however, will not be evenly distributed across the Arctic. The strongest warming in the winter (by 13 degrees Fahrenheit) will occur along the coastal regions, with moderate warming (by 4 to 6 degrees Fahrenheit) along the North Atlantic rim. • Tundra in Alaska and northern Canada will be reduced and replaced by boreal forests and shrubs by 2059. Within another 40 years, the tundra will be restricted to the northern coast and islands of the Arctic Ocean. Of course, there will be regional variations in the response of tundra vegetation to rising temperatures. Influences such as summer ambient temperatures and soil moisture content will play a part. But these reports do point out that particularly sensitive Arctic regions may see much greater changes than we previously thought. For tundra wildlife, that news is not good. On average, mammals could lose as much as 40 percent of their present territories. And quite probably they won’t be able to expand into new ranges fast enough. But climate change and the growth of shrubs into trees may not even be the tundra animals’ biggest hurdle when it comes to moving with the changing lines of their natural habitats. The biggest obstacle may be us. In the past when climates have changed—between glacial and interglacial periods—wildlife didn’t have to deal with agricultural fields, four-lane highways and parking lots. Species could move much more freely across the landscape. Now, they could very well be facing the biggest runner’s marathon of their lives. In light of this fresh report regarding the shrubs already in the tundra turning the landscape to forest, do you think Arctic wildlife will be able to outpace the changes? Very informative article indeed. The aim of this paper is very important-Restoration of ecological balance of most fragile zone of the globe. Who would ever imagine such a change and its repercussions? Your posts are always interesting and informative. Incredibly eye opening! Amazed at the far reaching consequenses of our changing world…very alarming. I knew but didn’t know. Your article, well written, spoke to the heart. Where do we go from here?! I think the Polar Bears will be just fine. The models behind global warming have been historicaly inaccurate – in the 70’s there was great fear of global cooling (worse outcome than warming) according to the models. The models today assume that increased CO2 causes (and is one of if not the main cause of) global warming. These models are based on an unproven assumption. Don’t get me wrong, global warming is occurring to some extent. What is at question is the cause and wether or not man is causing it or has any control over it (or even if we should). Al Gore did show temperature data over thousands of years that showed a correlation between CO2 and temperature. What he didn’t say, and what most people do not know is that CO2 LAGS temperature. This supports higher temperatures causing higher CO2 and not the opposite. Temperatures better follow solar activity (sunspots,etc). Do your iwn research and do not get caught up on the global warming bandwagon. Yikes. I didn’t consider the effect of proliferating vegetation on the Earth’s albedo. And habitat loss combined with habitat fragmentation is a double-whammy when it come to causes of extinction. It looks more and more as if the environment will be changing faster than the wildlife can keep pace. Hopefully, they can adapt and we can slow our impact on global temperature increases.